Want to know how the Watertown, Massachusetts real estate market is doing? 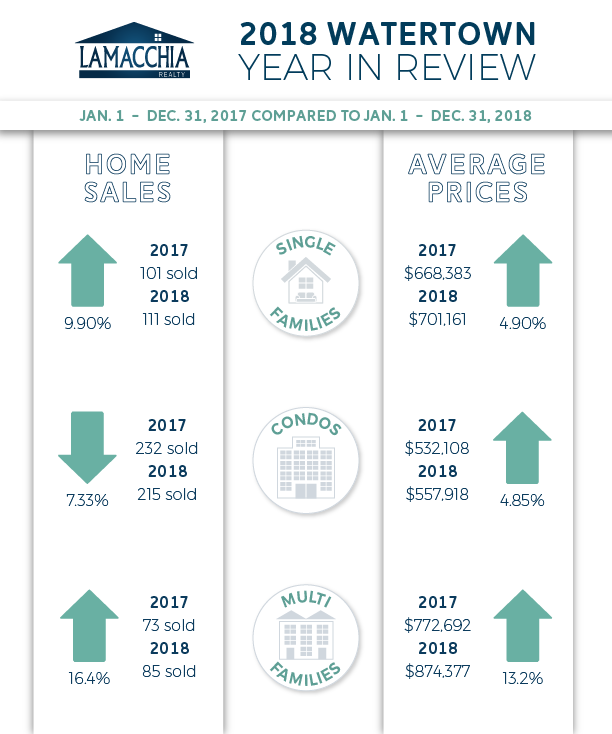 In this 2018 Year in Review Housing Report, we’re looking at home sales in Watertown for 2018 compared to 2017 and how the market is currently performing in that area. As of December 31, 2018, a total of 411 homes sold in Watertown at an average price of $711,152, which includes single families, condos, and multi-families. Prices in Watertown are up by 8.67% over 2017 when they were $654,443. Sales are up by 1.23% over last year when there were 406. In 2018, there were 476 homes listed, up by 15.5% from 2017 when there were 412 homes listed on the market. 391 homes went pending in 2018, up by 3.71% from 2017 when there were 377 homes that went under contract. To learn more about how Massachusetts and New Hampshire performed in 2018, click here.